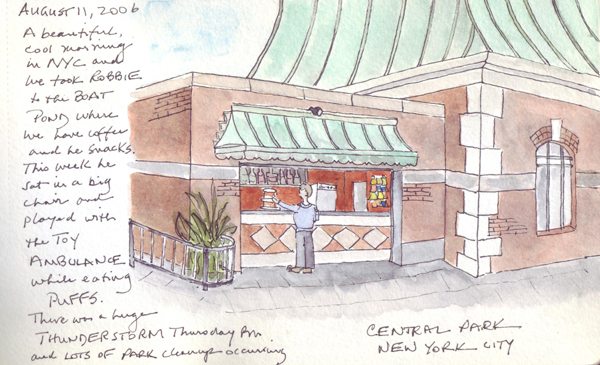 The official name of the pond on the Eastside of Central Park just north of 72nd St. is the Conservatory Water. Our family, however, calls it the Toy Boat Pond because remote guided sailboats can be rented there and the pond is always full of boats - and at least one duck family. We spent another glorious morning there last Sunday morning - sitting under an umbrella at a table at the Terrace Snack Bar. We sip coffee and while I draw and paint, my husband does the NY Times crossworld puzzle. 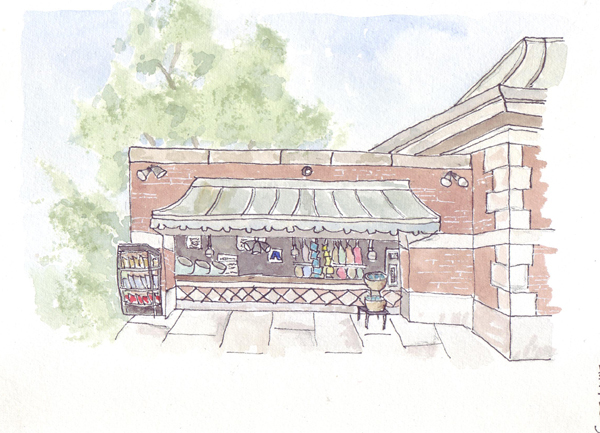 Here is my painting of the Snack Bar from last Sunday morning. 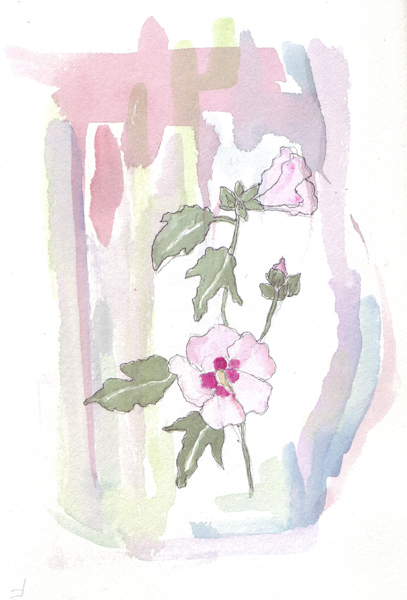 And here is my latest flower painting from the lovely garden surrounding the Terrace. This is my previous painting of the same location. We took care of our 3rd oldest grandchild on Friday for many years and this was our favorite morning walk, weather permitting. 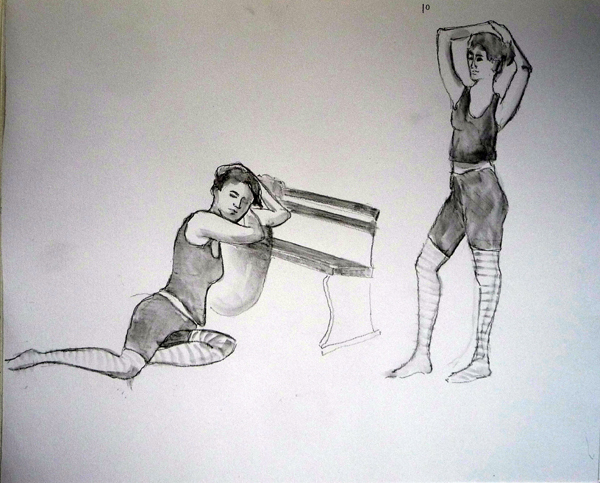 The Battery Park Conservancy sponsors a free figure drawing session each week May through September. They provide the supplies and the model and we all gather in the park next to the South Cove (weather permitting). 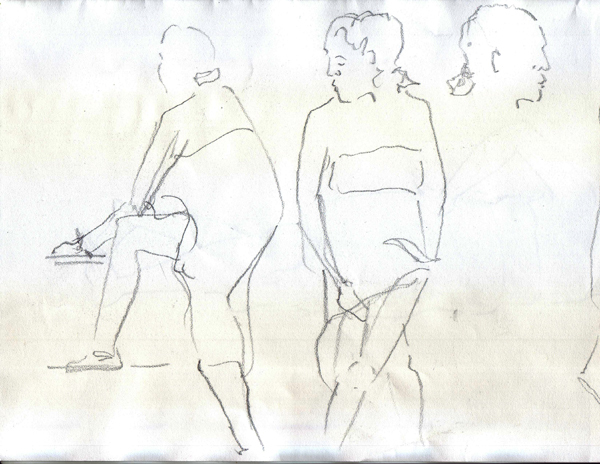 I really liked the model last Wednesday, and sketched multiple figures on each sheet of paper. Some of them were sketched with General's Sketch and Wash pencil and then brushed with my Niji waterbrush. 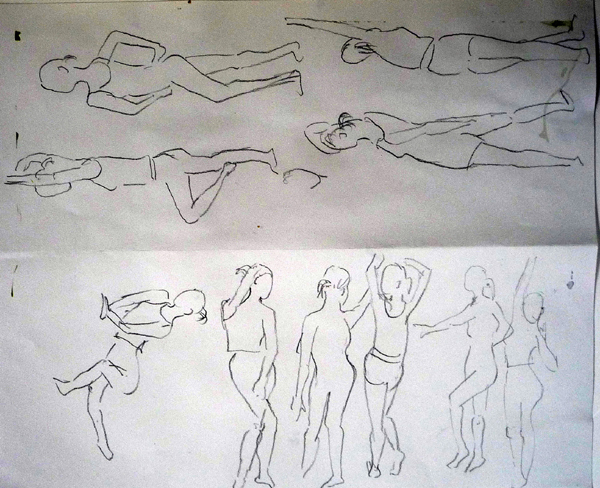 Here are 10 One Minute Drawings: I don't even breath during these!! 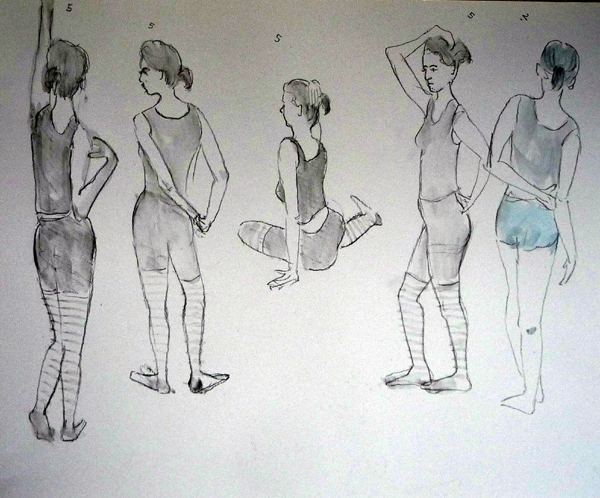 I am trying to "draw" figures with my paintbrush and watercolor paint. I posted several drawn this way in the past - but they were from photos. 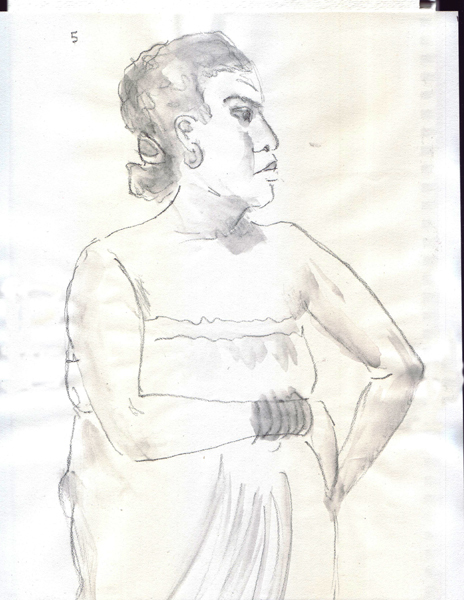 This is my second watercolor drawing from a live model. PRACTICE, PRACTICE, PRACTICE!! My big sheets of paper needed to be photographed, not scanned. I try to get rid of the blue tinged background in Photoshop using the threshold settings, but can't get back to white! Any suggestions? 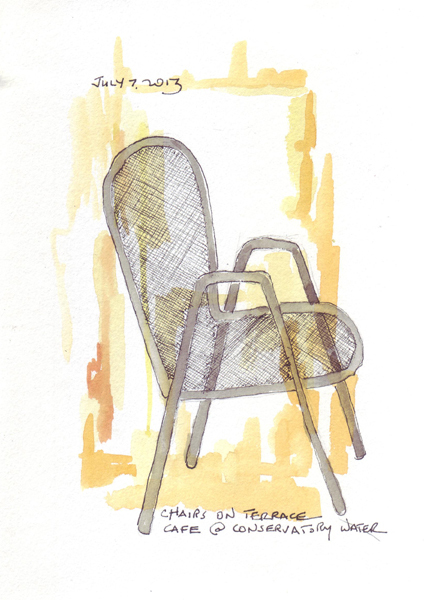 I am posting some of the sketchbook pages I did during July - evidence that I really do still use my sketchbooks amidst the bookbinding, figure drawings, and museum visits with my artist friends. One of these was done in an outdoor café and three were done in restaurants. I bought this 8 X 11" book for $2 at a New York City thrift shop so I could try converting it into a Coptic book with watercolor paper. 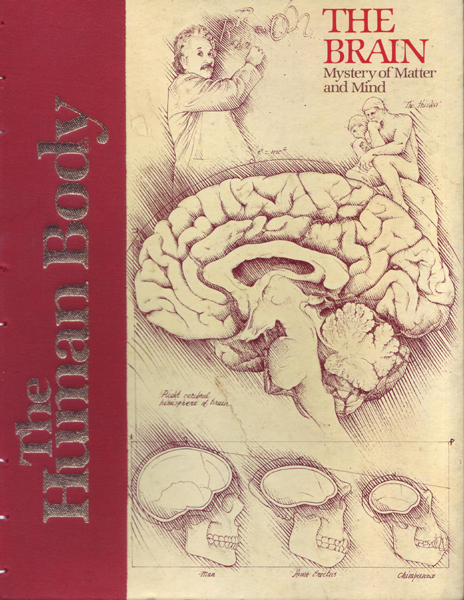 I removed the page block and the book board inside the book cloth in the spine. I cut the spine book cloth down the middle, folded it to the inside, and glued it in place. Seven holes were punched in the front and back covers and I sewed in 4 signatures of 140 lb watercolor paper. I plan to use this book for more watercolor painted figures. This is another book idea that I liked, and I finally made it this past weekend. It is a quilted cover with front and back cover pockets for pens, index cards, and extra papers. The taxi fabric is the pocket. Here is the front. 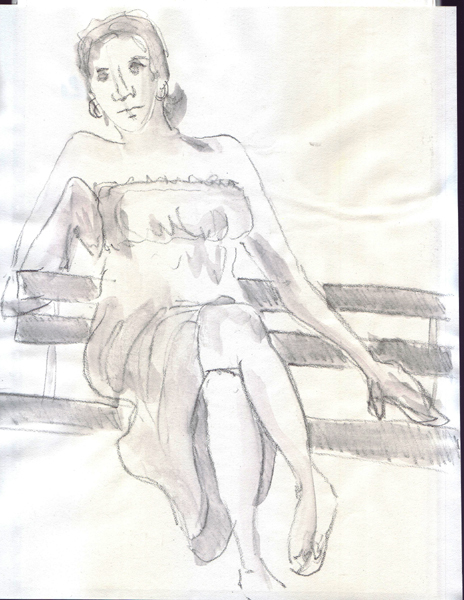 Yesterday was my first day this summer at Battery Park Figure Drawing. The heat wave broke temporarily and it was cool and breezy sitting in the South Cove. 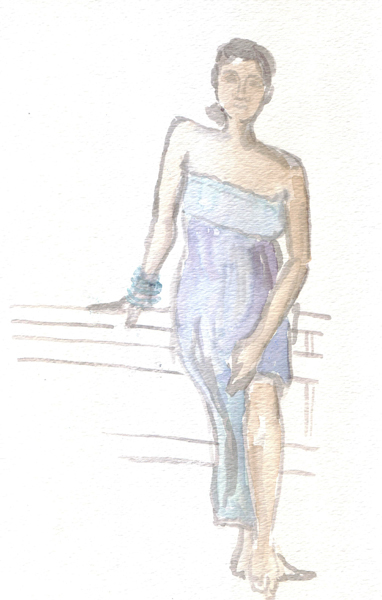 The model wore a strapless, flowing dress, making it hard to see her form. Here are a few of my drawings. 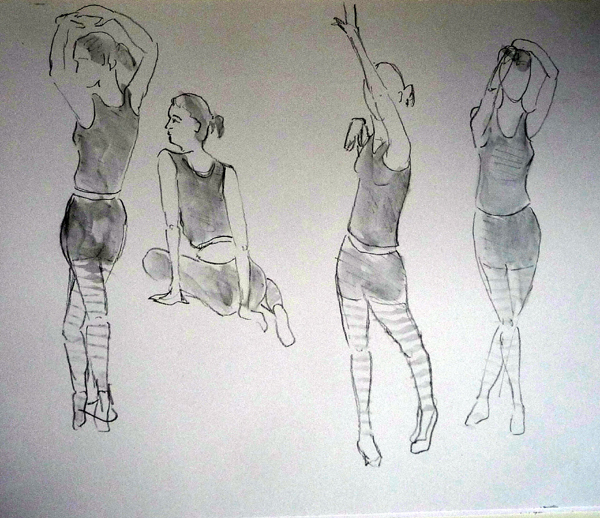 Five Minute Poses: I used a General Sketch and Wash pencil and added water. The slightly buckled paper did not scan well. 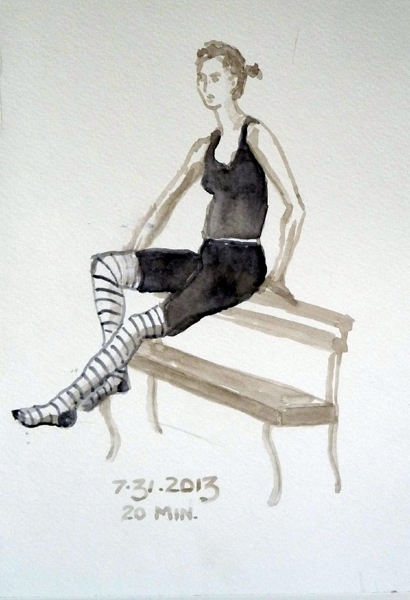 Ten Minute Pose: My first attempt drawing a live model with my paintbrush and watercolor. This was the only one worth showing.